If you have ever had the pleasure of your calves being so pumped out that you have to hang on your axes to de-pump or when the idea of taking a 60ft fall is tempting just so you would be able to sit for a while – you will understand why when I try to get in shape for a winter trip, if I do nothing else, I will beast my calves. I find nothing more discomforting than, when on a ice route, your calves pack up. My theory is that, while you are able to stand happily on your front points, you remain in control and therefore can remain fairly safe . In early January 2009 I was going to go to the Mt.Blanc massif and go soloing for a week – the aim was to be self sufficient – live in a snow hole and do some routes on the Tucal. Therefore calves were an important part of my training. There is a lot of ice, often bullet hard, meaning lots of front pointing. Weight wise – with plastic boots & crampons, axes, various clothing required, rucsac, a couple of ice screws/abolokov threader, a pair of 60m half ropes to rap, tat, harness, a bit of water and some snacks you are probably going to weigh around 20kg more than if you stood naked. So bearing that in mind that you are going to be heavier than if you are leading when climbing as a pair – making sure your calves are have good strength and endurance is critical to your safety. At the time I had a spare room in my house & a load of wood from an old fingerboard frame and an ikea bed I recently dismantled – so feeling fairly creative I made the mother of all calf training rigs.. This rig enabled me to stand on my front points, carrying a 20kg weight bag and do sets of one/two foot calf raises to build strength or spend around 5 minutes at a time on one foot to build up endurance. With the stack of rungs – I was also able to use it to train my thighs in a style similar to the requirement on steep ice. The projecting bars at the top acted as handles for moving up and down. 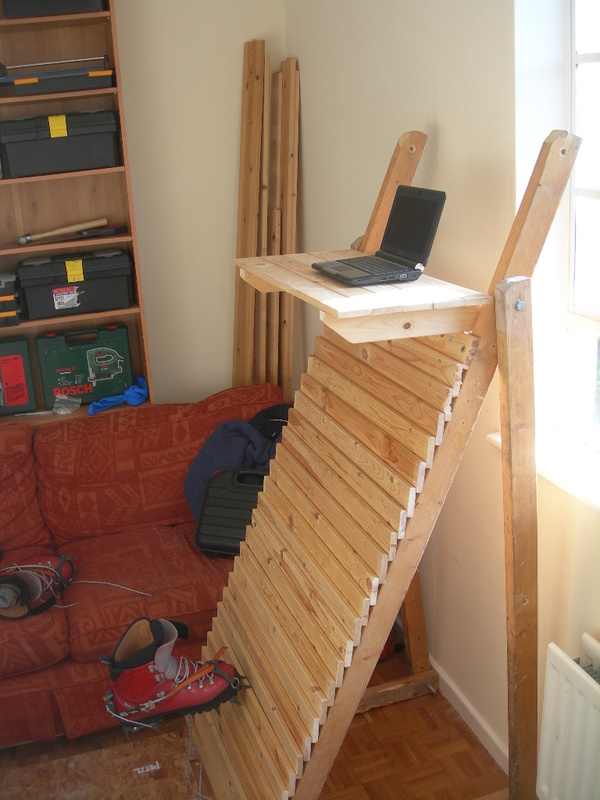 I even made a removable shelf so I could do work or watch iPlayer while I trained – this is good as it takes your mind of the pain; as a form of training, it is pretty boring. End note: I feel it is important to train using boots and crampons; the location of the points is so much further away from your toe meaning that the leverage on your calves is greater. When doing calf work in trainers the point of leverage is somewhere behind the big toe – this does not stress your calves nearly enough to feel confident in your strength. Have you built anything similar? Do you have any good calf training techniques?